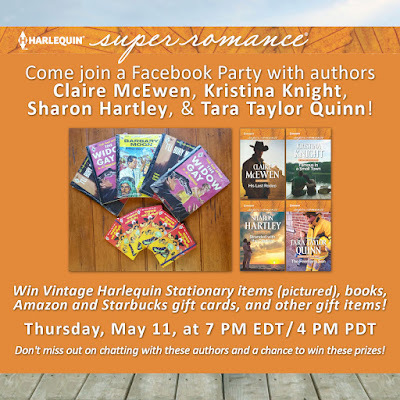 Harlequin SuperRomance Authors Blog: May Superromance Authors Are Having a Party! No facebook for me, but have a wonderful party! I'd want to hear why they chose to become a romance writer—who or what inspired them; how long did it take to get their first book published; how did they learn how to submit a manuscript to a publisher; did they receive rejection letters; how long does it take them to write a book; how do they feel about reviews, good and bad; how do they plot out their books; where do their ideas come from; do they construct Pinterest boards for their books; how are the covers chosen; do they prefer writing stand-alone books or series, and why; have they wanted to venture into writing other genres besides romance, like mystery; do they use people they know in their books. Uhhh...I think this posted in the wrong place. Sorry.